Cobalah ajukan aplikasi sekarang juga - Looking forward to your application! The Best Japanese Language School! The only one Japanese language school in Indonesia with the bright future for the students. A guarantee for working after graduation and possibility to proceed school and training in Japan with more than 60 schools in Japan as a partner, there is no school like this in Indonesia with a strong support from various schools in Japan. We are only giving you the best quality for the best student, learning Japanese language from the basic upto the advance level. Including learning directly from the various Japanese professional (CEO). One Year Courses, Graduated, Guaranteed Enter The Company. Make no mistake on your life and prepare your future life, a guarantee to work and speaking fluently Japanese language after graduated on our Regular Program. Total visitors on the 9th JEFI is 1493 persons registered on us. Thank you for all parties supported us. Looking forward your support on the next 10th JEFI at the year 2013. All educational institutions gather in one place. Various culture from Japan also presented in the 4th Floor of SariPanPacific Hotel, Jakarta, Indonesia, September 1, 2012. 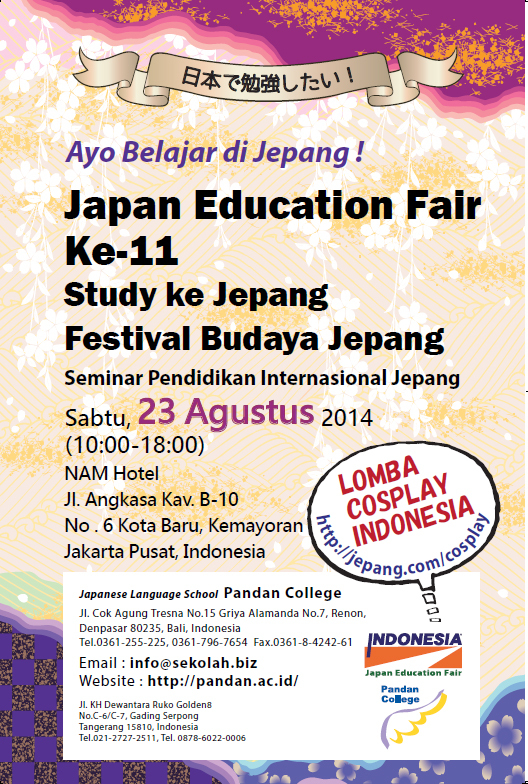 All welcome and free entrance to widen the knowledge of Japan.